Dhaka, Bangladesh. 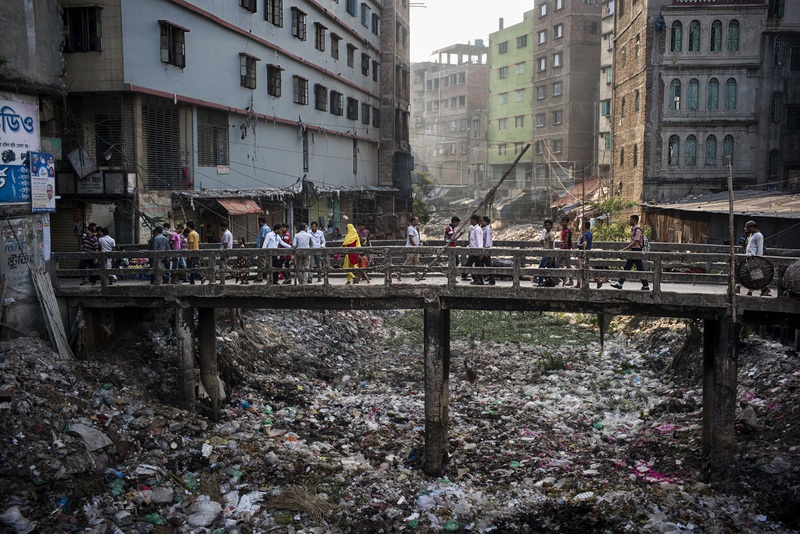 In the Keraniganj district, which is home to numerous clothing workshops, the bed of a canal that flowed into the Buriganga River is filled with rubbish. The water no longer reaches the river because of the masses of waste accumulated along the canal. Dhaka, Bangladesh. Dans le quartier de Keraniganj qui abrite de nombreux ateliers de confection de vetements, le lit d'un canal qui se jetait dans la riviÃ¨re Buriganga, est rempli de dÃ©tritus. L'eau n'atteint plus la riviÃ¨re en raison des masses de dÃ©chets accumulÃ©s tout au long du canal.